April is my favourite month of the year. It’s when we say a fond farewell to all the ingredients we have come to know so well over the winter, and welcome with open arms the plethora of wonderful spring produce that Britain has to offer. Preheat the oven to 200 ̊C, gas mark 6, and make sure you have 2 shelves available. Bring a large pan of salted water to a rapid boil and simmer the asparagus for 2 minutes; remove and immediately plunge into a bowl of ice-cold water. Drain and dry, then toss with 1 tbsp olive oil. Season and scatter over a baking tray; set aside. To make the beurre blanc, put the diced shallot, bay leaf and vinegar in a pan; boil until reduced to about 1 tbsp of liquid. Reduce the heat to low and add the chopped cold butter to the pan, a few cubes at a time, stirring continuously until it has emulsified into a sauce. Season and add a squeeze of lemon juice; set aside. Season the salmon fillets with sea salt and heat the remaining 1 tbsp olive oil in a heavy-based, ovenproof frying pan over a medium-high heat. Cook the salmon, skin-side down, for 2 minutes. Put the frying pan on the lower shelf of the oven and the asparagus on the upper shelf; cook both for 8 minutes. To serve, stir the tarragon (or sorrel) through the beurre blanc. Toss the asparagus with the thyme, lemon zest and juice of 1⁄2 lemon. 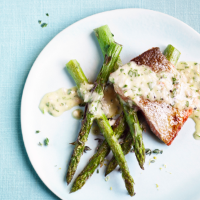 Arrange the salmon and asparagus on plates and spoon over the warm beurre blanc just before serving. This recipe by Mark Blatchford is head chef at John Doe, first appeared in Waitrose Kitchen magazine, April 2015. myWaitrose members can download the Waitrose Kitchen app edition for FREE. Find out more.